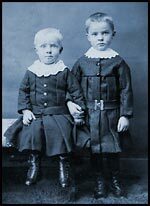 Arthur and Russell, the two sons of J.W. Smith, the first mayor of the city of Regina. All Frocked Up deals with the history of female and male impersonation, performed as entertainment in Saskatchewan. The idea arose from a project documenting drag in Saskatoon, part of an ongoing effort to preserve the history of Saskatchewan’s gay and lesbian communities. 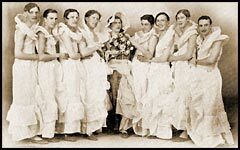 Background research led to the discovery of older traditions of ‘theatrical’ cross-dressing in Saskatchewan that seemed unconnected or only distantly related to more recent gay drag performances. Given the social conservatism of our traditionally agrarian province, it initially surprised us that our forebears should have been so taken with entertainments not only prohibited by the Bible, but long colored by associations with sexual aberration and misogyny. Among the treasures at the Western Development Museum are scrapbooks documenting the enormous range of live entertainment offered at Saskatoon’s Empire Theatre during the first part of the 20th century. The heavy albums preserve hundreds of clippings and programs relating to British style pantomime and American vaudeville, two of the major theatrical forms to embrace gender impersonation. The recipe for British pantomime is simple. Take a well known fairy story – Mother Goose or Puss in Boots - and present it with as much music and magic, slapstick and spectacle as possible. One stock character is the ‘Principal Boy,’ always played by a young woman clad in tights to show off her legs. The principal comic, the ‘Dame,’ is usually an older female character played by a man. Many such pantomimes, including Cinderella and Red Riding Hood, were presented at the Empire by traveling companies. 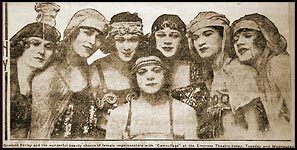 From 1910 until 1930 vaudeville bills hosted at the Empire offered every conceivable type of clean entertainment, including many acts by both male and female impersonators. These performers were not considered freaks but instead classy performers suitable for family audiences. Female patrons especially seemed to love their glamorous gowns and finery. During the 1920s the Empire frequently presented the Dumbells, an immensely popular musical revue performed by Canadian ex-servicemen. The Dumbells were first organized in 1917 as an army concert party to entertain Canadian troops at the European front. Their programs always featured male soldiers singing and dancing in lovely dresses. In Never Sleep Three in a Bed, a memoir of his youth in Saskatoon, novelist Max Braithwaite wrote of the excitement that greeted the troupe on their visits to the city and the audience’s fascination with the men in frocks. Ross Hamilton always came out in a beautiful gown and big hat and sang soprano. A real female impersonator. The house roared with applause, after his sentimental song, Danny Boy, not so much for the quality of the singing as for the fact that he was doing it. Imagine that, eh? You’d never know he was really a man. Wearing clothes of the opposite gender is as old as theatre itself. Until the Restoration of Charles II in 1660, female roles in English theatre were played by men or boys as it was considered improper for women to appear on stage. Since the acceptance of women as actresses female impersonation in the theatre has primarily been used for comic effect. It is a show biz maxim that a man in a dress is always good for a laugh. However a woman disguised as a man is usually viewed as a threat. Brandon Thomas’s 1892 farce Charley’s Aunt has been performed many times in Saskatchewan including a professional production at the Empire Theatre in 1916. Two Oxford students, Jack and Charley, persuade a third student to impersonate Charley’s aunt, Donna Lucia from Brazil ‘where the nuts come from,’ as they need a chaperone to entertain young ladies to tea. Unfortunately the fake Donna Lucia attracts two male suitors whose attentions (s)he must deflect. Other recorded Saskatchewan drag turns include a performance by Saskatoon’s Ian Nelson as Aunt Alicia in a 1986 Gateway production of Gigi and a legendary closing night performance of Lady Bracknell by the male director of a Greystone Theatre production of The Importance of Being Earnest. Spectacular comic drag enlivens the final act of Geoffrey Ursell’s 1982 musical comedy Saskatoon Pie! in which the whole cast performs a parody of a cross-dressed Victorian operetta entitled Magic Reversals. Besides laughing at gender impersonations on the stage many of us seem happy to cross-dress in a frock or suit from time to time for kicks. Despite, or perhaps, due to Saskatchewan’s relatively rigid gender roles, dressing up in costumes is a common feature in prairie social life. Folklorist Michael Taft has documented elements of transvestite behavior in many Saskatchewan community activities including parades, sporting events, stag parties, Hallowe'en, school initiations and variety nights. Taft has also explored the mock wedding tradition, an intriguing form of transvestite folk drama which blossomed on the Canadian prairies. 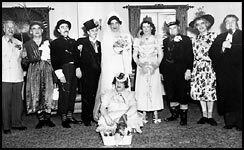 Mock weddings are cross-dressed parodies often performed as part of a community’s celebration of a couple’s marriage or milestone anniversary. The women who organize these skits play fathers, preachers, priests, and ring bearers. Taft wondered why macho male farmers and ranchers would agree to dress up as brides, bridesmaids, and flower girls in these weddings. He found an answer in the distanced performances offered by the men – exaggerated, mincing impressions that make a mockery of femininity by emphasizing the performer’s own masculine characteristics - hair, muscles and swagger. These ‘real’ (i.e. heterosexual) men in drag constantly let you know they are male to dispel any doubts as to their virility. Cast of a “womanless” mock wedding. The exhibition includes many photos of cross-dressed students from the University of Saskatchewan Archives. One wonders why so many male college students have been donning feminine attire in amateur theatricals for so many years. Perhaps the tradition began with the initial exclusion of women students at many of the oldest and most prestigious universities. Although co-eds have been common on the U of S campus throughout its whole history the school’s newspapers and yearbooks are sprinkled with photos of male kick lines, male beauty queens and cross-dressed fashion models. 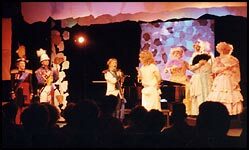 In 2003 Saskatchewan transvestite entertainment has become decidedly gay, with most of the audience and performers members of the local queer community. Notwithstanding the pivotal role played by drag queens in the Stonewall Riots of 1969, which sparked the modern gay liberation movement, the relationship between gender impersonation and gay politics has often been difficult. Many early gay activists were opposed to public performances that equated male homosexuality with effeminacy and some lesbians argued that drag was misogynistic and demeaning to women. 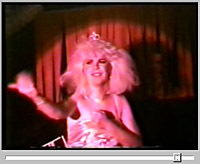 In the 1970s drag shows were prohibited at Saskatoon’s Gay Community Centre. Revues featuring both drag kings and queens are now presented regularly at gay clubs in Saskatoon and Regina by talented amateurs, many of whom are members of the Imperial Court System. The Court, an international fraternal organization of drag devotees, is represented in Saskatchewan by the Imperial Court of the Golden Wheat Sheaf Empire, now in its 12th year. Belatedly gay politics seems to have reclaimed drag as a visible means of expressing one’s queerness. Gay drag proclaims a disinterest in being tolerated or accepted if the price is conformity to the lives of dull and normal straight men.